This is a classic take on gray and white exhibited at the base with this trend forward Morrocan inspired patterned vase. Nothing is as sophisticated as white on white which is why we brought together white roses and white Oriental Lilies to create a look meant to give you that high end feel. 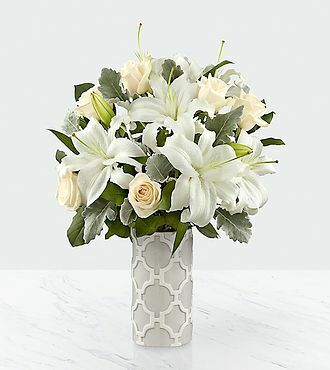 Offset by Dusty Miller leaves that brings the overall look together and compliments the vase perfectly, this flower bouquet was designed to bring a touch of modern elegance to your special recipients every day. IMPRESSIVE bouquet includes 9 stems with vase. Approximately 19H x 15W. STUNNING bouquet includes 16 stems with vase. You save over $7 at FlowersFast! (Compare to FTD retail price: $99 + $22.98 for same-day delivery.) You get the same quality, at a lower price! No extra charge for same-day delivery. FREE personalized gift message included. (Extra delivery charge for Alaska and Hawaii) Same-day florist delivery is available for this item, for orders placed before Noon in the recipient's timezone. Please see the Ordering and Delivery Information.